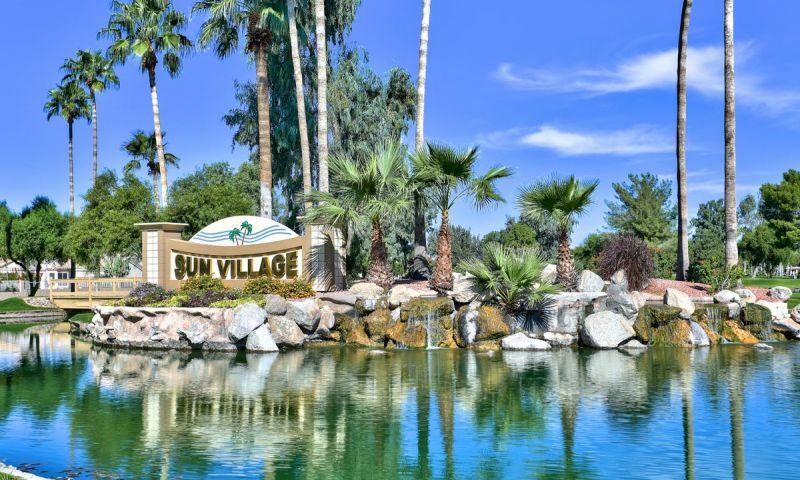 Sun Village is an established 55+ community located in Surprise, Arizona. This gated community is ideal for homebuyers who want the benefits of active adult living in an intimate setting. Sun Village features many amenities and activities that cater to those who are focused on both a physically and socially active lifestyle. The community is comprised of 1,382 low-maintenance homes. Homebuyers can choose from attached townhomes or detached patio homes. The Sun Village Community Center is at the heart of the community. This welcoming center is home to a 47,000 square-foot clubhouse and provides many desirable amenities to its residents. The clubhouse is a popular meeting place for clubs or simply a place to relax with neighbors. Inside of Sun Village s Community Center residents can work out in the fitness room, get a haircut in the beauty salon, or eat dinner in a full-service restaurant. There is always something to do at Sun Village s Community Center with a ballroom, woodworking shop and arts and crafts studio. Residents can also attend service at the community church, play billiards, or unwind with a book in the library. Residents are invited to take advantage of the Arizona sunshine with outdoor amenities that spread throughout the community. With numerous tennis, shuffleboard, and pickleball courts residents can catch a game with neighbors and friends any day of the week. There is even a resort-style pool and spa equipped with lockers and lounge chairs. Golf enthusiasts are fond of the low fees at the Sun Village Golf Course, a public golf course. Sun Village was developed in the mid 1980's and by 1995 it was completed with 1,382 homes. This mature community features low-maintenance, single-level homes with attached townhomes and single-family patio homes. The attached townhomes feature at least one bedroom, one bathroom, and an assigned parking spot. The patio homes provide an open layout and at least one bedroom, one bathroom, and an attached garage. Many homes feature golf course views and beautifully landscaped front yards. There are plenty of activities available in Sun Village. The full-time activities director is available to help coordinate recreational activities and social clubs. Whether your favorite activity revolves around social clubs, sports teams, or simply mingling with friends at various community events, there is something for everyone at Sun Village. There are over 30 clubs and interest groups that meet on a regular basis. Some of the more popular groups include bridge, euchre, and bunco or craft and hobby clubs like stitchery and model railroad club. Sports enthusiasts enjoy the various fitness-minded clubs such as golf, tennis, pickleball, table tennis,Tai Chi, and shuffleboard. Other residents find joy in book clubs, bible study, singles club, and RV club. Perhaps you are interested in rekindling an old hobby or starting a new one, Sun Village offers an exciting array of activities and clubs. Sun Village is conveniently located 30 miles northwest of Phoenix in the booming city of Surprise, Arizona. Outside of the walls of Sun Village, you will find the spring training stadium of the Texas Rangers and Kansas City Royals. Hike or bike to a rare desert waterfall at White Tank Regional Park located on the western edge of Surprise. With many activities throughout the area, residents enjoy Sun Village's location. The Sun Village Community Center is open to all residents of Sun Village. Many clubs, classes, and interest groups meet here on a regular basis. Community Center - 47,000 Sq. Ft. Residents pay a low rate to golf the 18 holes provided by Sun Village Golf Course, a public golf course. There are plenty of activities available in Sun Village. Here is a sample of some of the clubs, activities and classes offered here. The townhomes at Sun Village are single-level attached residences. These homes range in size from approximately 634 to 953 square feet. The low-maintenance homes feature at least one master suite and bathroom. Some homes have designated parking spots or a covered carport. The patio homes of Sun Village are single-level detached homes. They range in size from approximately 1,186 to 2,106 square feet. These low-maintenance homes feature an attached two-car garage and many feature dens that have been converted into an extra bedroom. Really great community in an excellent location. Surprise is growing so quickly and this community is situated next to so many restaurants, shopping, and other activities. It is right off the freeway too and has a very pretty landscape. In no way is anyone "strong urged" or otherwise encouraged to become an evangelical Christian. The overall religious/ethnicity of anyone living here is important only to someone who feels their own narrow view of society should be followed. I have found the people welcoming, and friendly, both the winter visitors and year round residents. You can choose to participate in any number of activities, or not, as you wish. Weekly "blasts" are sent out letting you know of upcoming activities. I am a full-time resident of Sun Village since summer, 2014 and have found the community to be beautiful, active and welcoming. Although the majority of the residents are white, evangelical Christians, I have not felt any pressure from the residents here to conform to their beliefs. I have found the residents overwhelmingly warm and welcoming and feel I could not have found a nicer place to retire. I think it is the BEST place to spend the winter. The gated village gives a very safe feeling and it is small enough that is is easy to get to know people. There are so many activities of all types that there is no excuse to be bored unless you have health problems. The Activities Director is super with high quality entertainment with lots of variety. We get some entertainers from Branson, etc. and no ticket is over $20, and many are within walking distance. There is a minimum 3 month lease in the condos so people are there long enough to make friends and get to feel a part of the community. Residents are strongly urged to become evangelical christians. 55places.com is not affiliated with the developer(s) or homeowners association of Sun Village. The information you submit is distributed to a 55places.com Partner Agent, who is a licensed real estate agent. The information regarding Sun Village has not been verified or approved by the developer or homeowners association. Please verify all information prior to purchasing. 55places.com is not responsible for any errors regarding the information displayed on this website.